Perhaps the best beginning for a closer look at water sports on Callawassie Island is from the closest seat you can get to the water’s sparkling surface. 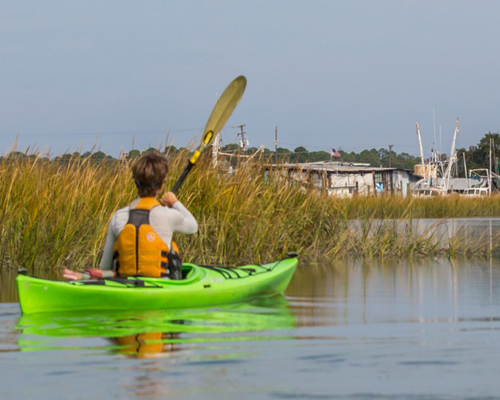 Callawassie Island kayakers have found a vantage point that is unparalleled in its beauty and serenity. We launch from the “Paddler’s Dock,” right at the foot of the causeway. There you’ll see 36 colorful kayaks, stacked in six racks of six kayaks each. Even when they are not in action, it makes a kind of festive display. Selecting our kayak and launching it, a tidal creek is followed that runs parallel to Sugar Mill, the dock where Islanders and their guests enjoy fishing and crabbing. And now the choices begin. We are at the junction of the beautiful Chechessee and Colleton Rivers. We can paddle on, to the middle of the languid Colleton River, or under the causeway to Spring Island on the Chechessee. We could head our kayak to Altahama, an ancient Native American ground on Heyward Point. And, depending on what our tide chart tells us, the time of our outing means the dappling of sunlight on the surface presents us with impressions that are never the same. We experience a mystical combination of the familiar and the new in the ever-changing play of light on tides, and in the choices that offer themselves to us each and every time out. The amount of time we spend on the water is another choice we are as free to make as the route we select. It can be a pleasant paddle of less than an hour for morning meditation, but about two hours is typical for a kayak outing here. That’s about how long it takes from the Paddler’s Dock to the River Club. Sometimes, our intrepid Paddlers set out to circumnavigate Callawassie Island, and that’s a four-hour trip to make it all around. 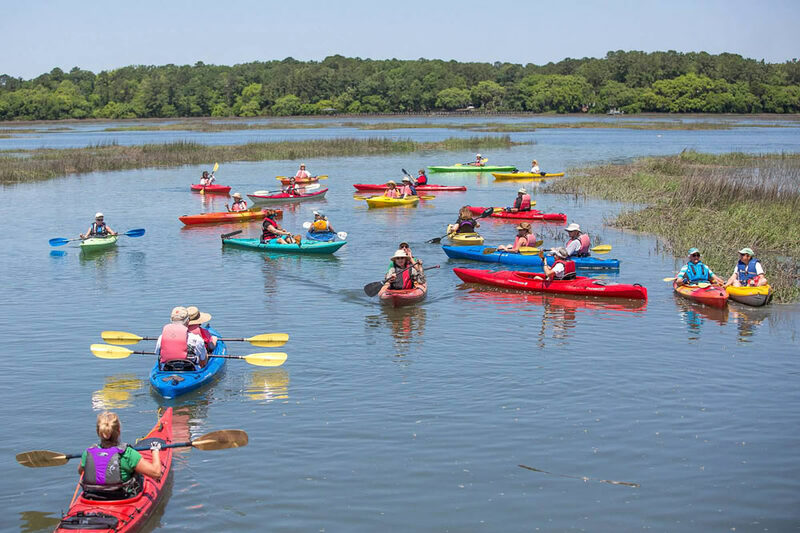 The amount of participation in kayaking is remarkable at Callawassie Island. Out of 500 homes, there are about 40 kayaks here, and about 200 people are part of the Paddlers Club. Even our newer residents often set out to become kayakers just to be closer to the natural beauty of the island. Certainly not everyone decides to stick with kayaking, but it says something that so many are interested in pursuing this fun, outdoor sport. And people remain part of the club even if they don’t continue to paddle, because it’s a load of fun. The three parties the club hosts each year are so entertaining, that around 150 of our 200 paddlers attend! Because of the beauty that makes kayaking so appealing, and because of the fun that follows, the Paddler’s Club has become one of the best places to get acquainted when new residents arrive. The “First Friends” group is another. 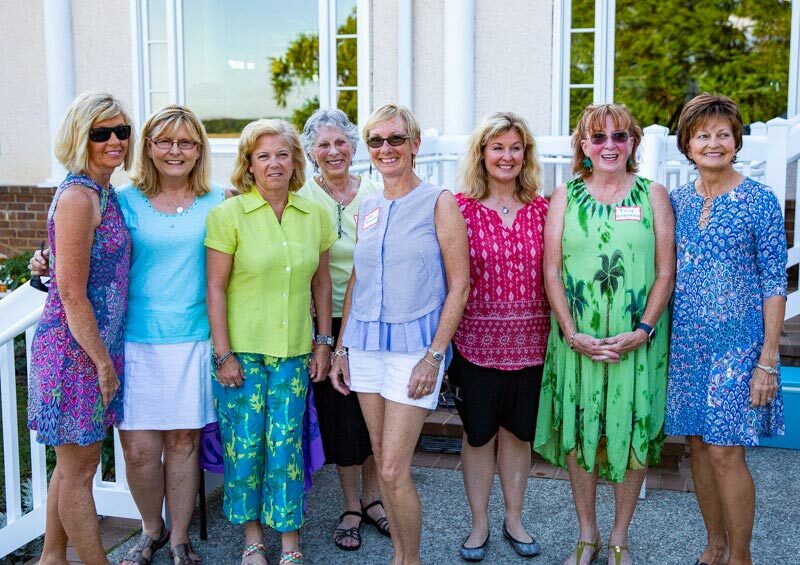 In early May, the First Friends hold their annual reception on the back patio at the Clubhouse. 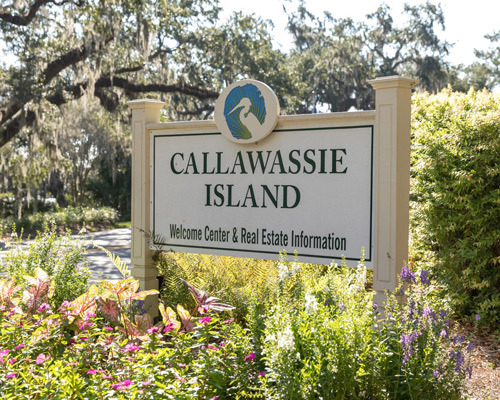 First Friends gives a focus to the many informal welcomes that people experience when they arrive at Callawassie Island. So many times, lifelong friends say that their first encounter here was when someone brought over barbecue, or coffee cake, and just said, “Hello,” when they moved in. 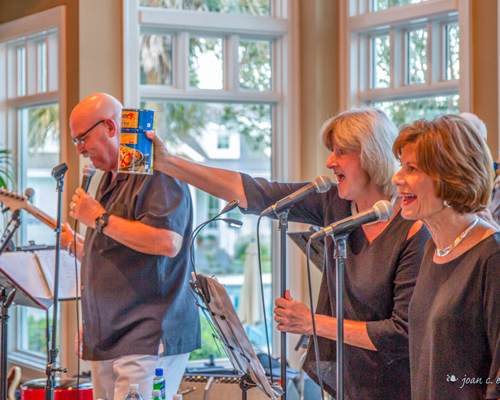 The Callawassie Island Members Club (CIMC) holds a reception each fall to celebrate new members officially, but no one waits until then to make our new neighbors feel welcomed. 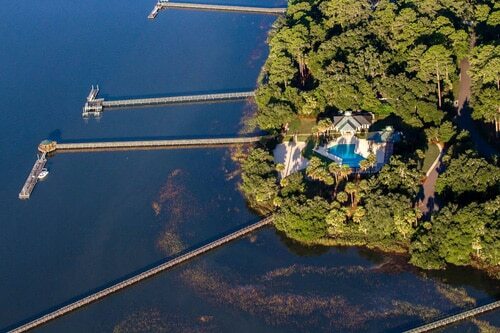 Several of the homes on Callawassie Island have their own Lowcountry docks, enjoying the surrounding waters from the comfort of their own back yards. However, there are three additional docks on island that serve all residents, one at the Sugar Mill Ruins and two at Callawassie Island’s River Club. Not only do residents fish and crab from these docks, but the River Club docks provide a place to tie up a boat for both a short term and a long term lease (depending on availability). While our tidal waterways may be the largest part, they are by no means the only part of our water enjoyment story. 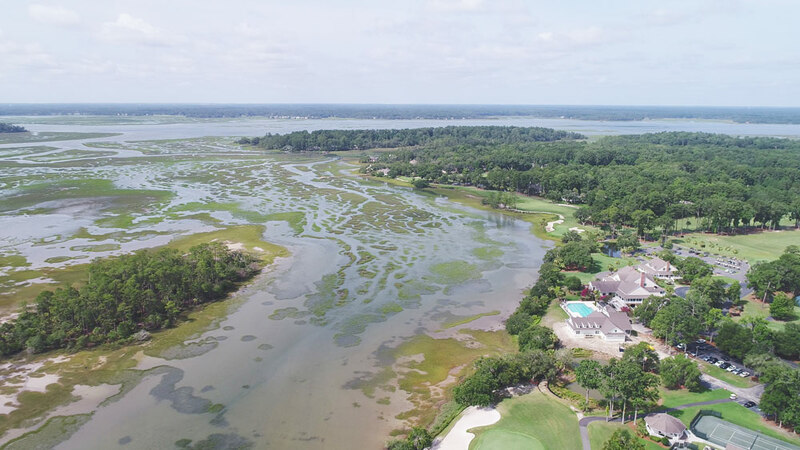 Bass fishing on the island ponds is praised by fishing enthusiasts, who catch and release, because Callawassie Island is a Certified Wildlife Habitat, the first in South Carolina. Callawassie Island’s two swimming pools play their respective parts in completing our aquatic enjoyment with water aerobics classes taking place regularly. The Clubhouse pool is for people ages 15 and up, featuring lanes for lap swimming. The River Club pool offers refreshing play and enjoyment for all ages, and it is here that the children who attend our Kids Camp each summer have their fun. Speaking of Kids Camp, our paddlers take campers out for a 45-minute kayak excursion in the waterways surrounding Callawassie Island, another perk of island living. Yes, our tidal rivers, the Chechessee and the Colleton Rivers, embrace Callawassie Island. And we embrace our rivers back in return. It’s part of the warmth and balance of living here, in one of the most spectacular private communities in South Carolina. And in many ways, the waters are part of our connection, too.